Home » Blog » A Dallas Personal Injury Attorney Explains What “Pain and Suffering” Means? A Dallas Personal Injury Attorney Explains What “Pain and Suffering” Means? When an accident occurs, there is often a person involved who, unfortunately, gets hurt. Typically, the injury involves long-term health changes for the victim and they have to adapt their life to the limited functions they may have. When a person seeks to press charges against the one who caused the injury, they will likely want to mention how the result of this trauma has altered their life, physically and emotionally. 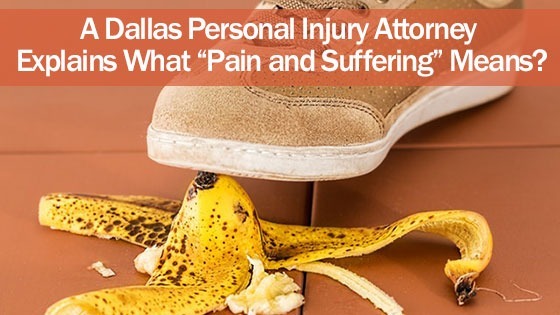 The Law Offices of David Kohm have expert Dallas personal injury attorneys that can help you determine if you qualify for “pain and suffering”. Pain and suffering applies in two different forms – physical and emotional/mental. Physical pain and suffering relates to injuries sustained after an accident, the pain experienced during the treatment process, and any long-term pain thereafter that is a result from continuous treatment or physical therapy. Emotional/mental pain and suffering refers to mental suffering a person endures after an incident which can include depression, fear, and anxiety. This type of suffering also applies to the negative feelings that can be felt if the accident causes the victim to miss an important life event. While pain and suffering pertain to many aspects of one’s negative experience after an accident, there are a number of things that don’t apply. Generally, it is difficult to prove that emotional/mental pain and suffering exists without the existence of a physical injury. A lawsuit without a physical injury may not have a positive outcome for the injured party. The rules regarding what will and will not be accepted in court are not always known by the average Dallas resident, so consulting with a personal injury attorney on how to proceed is the best course of action. When calculating the amount that the injured party should be compensated, the extent of the pain and suffering is taken in to consideration. A Dallas personal injury attorney will gather information related to the suffering and make calculations based on how badly the victim has been affected. The physical pain, scarring, disability, disfigurement, and the emotional toll are all figured into this calculation. The level of each is ranked based on how much distress it has caused. In this step, it is important to be honest about how much impact has been caused because if not, an insurance company or judge may feel that you’re trying to take advantage of the situation. Another common way to calculate pain and suffering is to apply a dollar amount to each day that pain is suffered starting from the day of the injury. When faced with challenging an insurance company, it is best to retain the help of an experienced personal injury attorney who will work in your best interest. Often times, insurance companies will not take an individual seriously and it will be quite difficult for that person to obtain a substantial outcome. Additionally, attorneys are well-versed in the laws and regulations, and how the process for making claims for pain and suffering works. Prior to going in front of a judge, an attorney can also present the option of settling to the insurance company, saving time from initiating a lawsuit. Call the Law Offices of David Kohm today at any of our convenient locations and get a free consultation.